This highly decorative etagere has two tiers, the top tier having Kingwood parquetry decoration with a gilt metal moulded decoration. This leads down to four gilt metal scrolling and foliate cherub supports to all four corners joining the top tier to the lower tier. The lower tier also with Kingwood parquetry decoration with gilt metal moulding and also gilt metal ormolu handles to either side forming a tray effect. 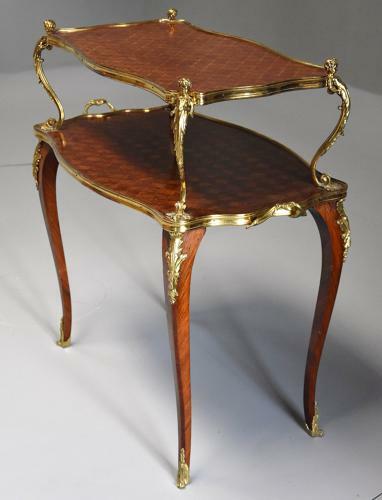 The table is supported by four cabriole legs with gilt metal acanthus mounts to the top and terminating with gilt metal sabots to the feet.